I find that talking about the Q is much easier if you have a commercial for it in your head. 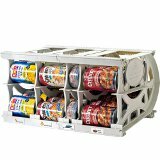 In my opinion, the Q is a game changer for the food storage industry. It is revolutionizing how, what, and when people buy food storage. With the Q—a customizable food storage plan—the customer is in complete control. Customers to choose what they want to buy, when they want to buy, and how much they want to spend. Using the online Q, a customer creates a queue or list of food items to purchase over time. Think of an online movie rental queue. The customer also chooses a budget amount to spend each month, and the date for the purchase to ship. Each month , about a week before the selected ship date the customer receives a reminder e-mail from Shelf Reliance that the shipment is coming up and listing what it is set to contain. The customer can easily make any desired changes to the order. On the shipment date the customer’s credit card is charged and the food is shipped. With the first sign up, the Q requires a three month commitment. After the three months are up, the customer can change their budget amount, pause, or cancel their Q. The items in the Q and their shipping order can be changed at any time prior to the shipping date. 2. Give accurate information. Don’t promise it will cure cancer or get a man on the moon, because it won’t, and people will see through your exaggerations. When I have a can of powdered eggs on the shelf I know that next time I want to make cookies, I won’t have to borrow an egg from the neighbor for the 9,276th time. When you read those sentences which made you want to buy a can of eggs? Probably not the first. The first sentence is accurate, and it is a great selling point. But it doesn't reach a customer emotionally. Try to share an emotion not just a fact. The Q is my favorite part of Shelf Reliance. It gets healthy food into my house and I don’t have to go to the store. And anything that keep me and three kids out of the grocery store is a win in my book. But that might not be real for you. Maybe you love grocery shopping, maybe you don’t have to take kids to the market with you. Maybe you would never really say something like that. If it is not real for you don’t say it in your commercial. 5. Peak their interest; don’t vomit information on them. As a new consultant you are probably really excited to talk about your new business. Try to avoid what I like to call Information vomit. This is when instead of giving a two sentence answer to a questions you give a 2 page answer. The goal is to give them enough info in a what that makes them ask a follow up question. Okay it is your turn: Take a few minutes a write a couple of Q commercials. After you have written down 3 or 4 and you are happy with them. Go find someone and actually say them out loud. Sometimes what looks great on paper feels dorky when you say it. Keep trying until you find something that feels right for you, and peaks the interest of the listener. o The Q takes the headache out of food storage. I no longer have this overwhelming task hanging over me. 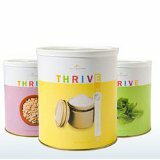 I made a few simple decisions and I am automatically building my food storage, each month. o I love the Q because it guarantees me the best prices, no coupons to clip, no shopping around, the best deal every time. o The Q is a lot like a movie rental Q. You create a list of items you want to add to your home storage and then you set up a budget that works for you family. Each month you are sent some of the items on the list that are within your budget. You can then use some of those foods to cook with and some of them can be stored for later use.